Beginning as the Wayne Agricultural Works in Dublin, Indiana in 1837, and incorporated in 1868, Wayne Works moved to Richmond in 1876. 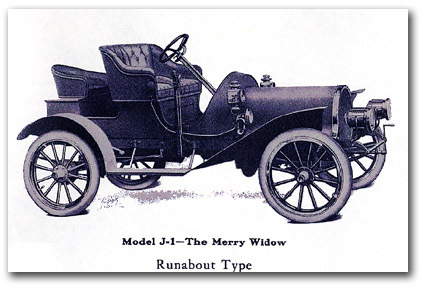 By the 1890s in addition to making farm implements, it was making carriages and horse-drawn “kid-hacks,” or early school buses. 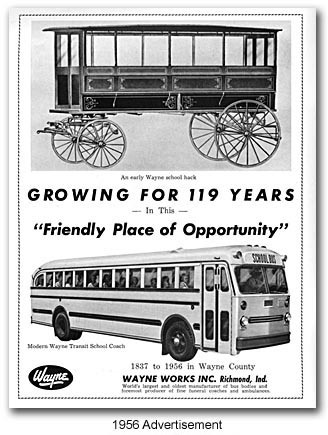 From 1906-1916 Wayne Works manufactured the “Richmond” automobile, but in 1914 it built its first school bus, and for most of the rest of the century, it was a major producer of buses. 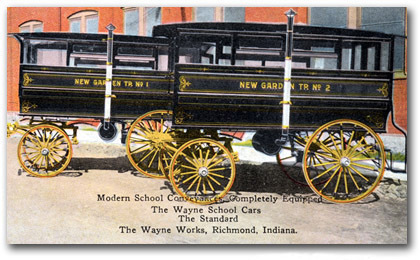 Wayne Works continued to make bus bodies for public transportation and school districts. During World War II it manufactured ambulance bodies for the military. 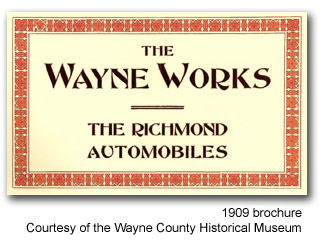 In 1956 Wayne Works merged with the Divco corporation of Detroit and became Divco-Wayne. When the company threatened to leave in 1964, the community launched a drive to build a new plant, which was opened in 1966 and was a $5 million, state-of-the-art facility. Wayne Works stayed in Richmond, but by 1993 it could no longer compete in the market and closed.